Testosim-E250 (testosterone enanthate) is an oil based injectable steroid, designed to slowly release testosterone from the injection site (depot). The usual dosage would be in the range of 400mg-750mg a week. This level is quite sufficient, and should provide the user a rapid gain of strength and body weight. Once administered, serum concentrations of this hormone will rise for several days, and remain markedly elevated for approximately two weeks. It may actually take three weeks for the action of this drug to fully diminish. 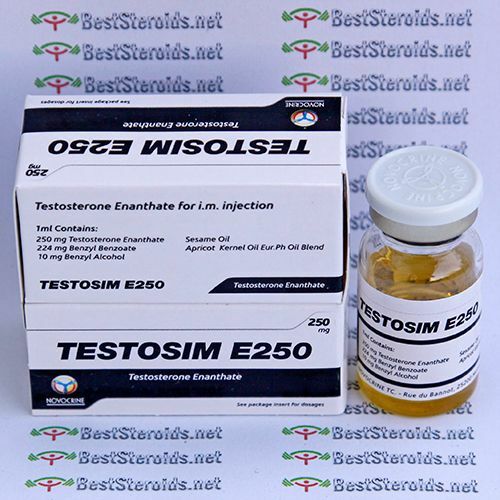 Testosim-E250 induces changes in shape, size and also can enhance the appearance and the number of muscle fibres and protect your hard earned muscle from the catabolic (muscle wasting) state. Got a few of these a bit earlier. Fantastic Product. The quality is top notch, really. As some before have said, this stuff is so smooth, no PIP whatsoever. The best part of all this, the gains/results. Def feel like this is one of the better blends going around. Would recommend anyone considering this product to give it a try. No way you will be dissapointed. Unless you don't do your part, u know, the working out and nutrition part. Amazing product! Smooth oil with zero pain or swelling. I love the way it has me feeling. 6 weeks in and I've gained good strength and size already. Had great results running at 500 mg per week. Been on for over a month and ive gained close to 15lbs. All signs of good test is there. Higher libido, oily face, strength and stamina increase, and definitely a feeling of well being. There is zero pip. Used 500mg a week of this stuff along with 400mg a week of Eq same lab and got some good results. Plenty of energy, fatigue was far less than before I started the cycle. Gained approx 15-18 lbs of muscle on a 10 week cycle. I am pretty sure Novocrine gear is g2g! I would say it is spot on as far as milligram is concerned. My strength is going berserk right now on this 6th week and my muscles are very full and feel strong. My mood is always good and I feel very content and confident just as good test should make you feel. I can confirm this product is legit.